Send me straight to the recipe! I think it’s because I’m never willing to use as much oil as they do in restaurants, but for the longest time I could never make fried rice at home that tasted even close to restaurant quality. This recipe does the trick, probably because I’m willing to use 1/2 cup full fat coconut milk where I’m not willing to use 1/2 cup straight oil, and because the the green curry paste gives you a good flavor wallop. 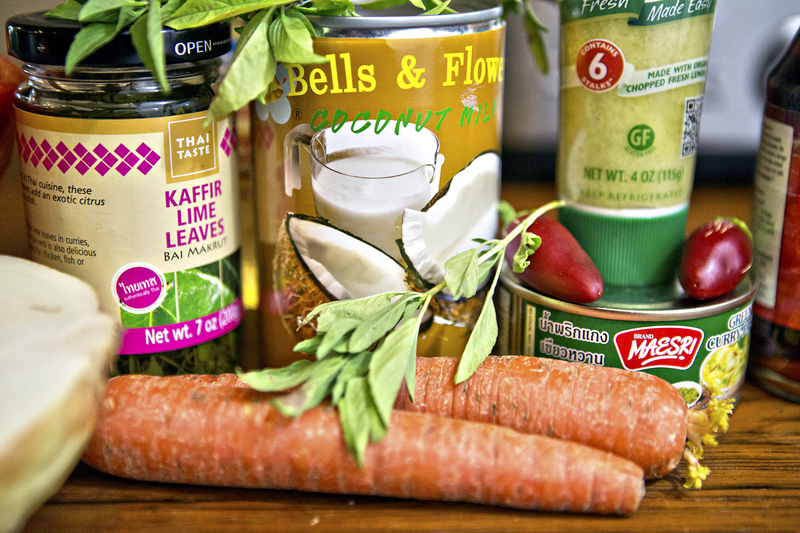 If you can’t find fresh or jarred Kaffir lime leaves, throw in some lime zest instead. Green curry fried rice is typically made with bamboo shoots, green beans and sometimes strips of bell pepper. Whenever I make fried rice though, it’s usually to use up what’s starting to get old in my refrigerator. Same goes for the meat. 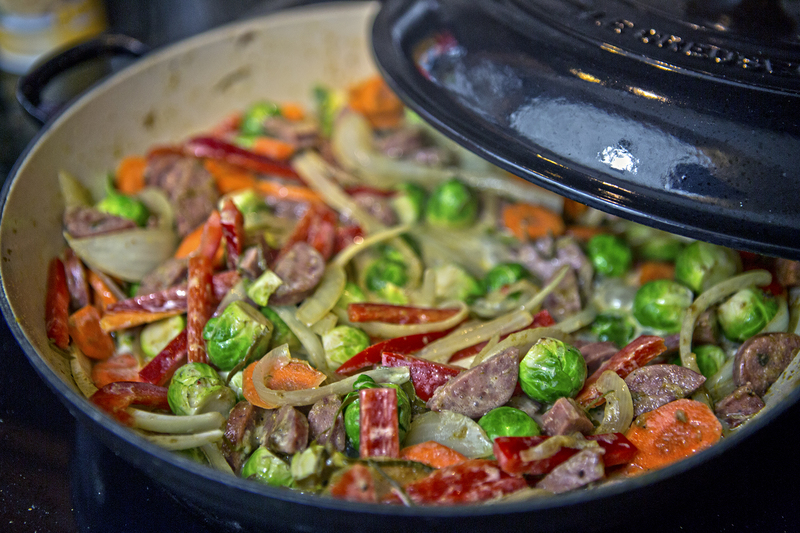 In this case, carrot, baby brussels sprouts, red bell pepper and venison sausage. This is one of those venison recipes that’s also great to use with meat that’s especially gamey, because the coconut milk and the robust spices really help tone down the flavor of a less palatable meat. One more thing to note: fried rice works exceptionally well with day old rice, or rice that has sat out for a little while. You can make the rice in the morning before work and leave it on the counter or uncovered in the fridge. That will also make cooking in the evening super quick, perfect for a weeknight. White or brown rice both work well here. Spray your pan with pan spray and scramble your egg. Remove from the pan, roughly chop and set aside. Start heating the pan on medium high while you chop all your veggies and pull the basil off the stems. Set veggies and basil aside. Add the oil and curry paste to the hot pan. Sauté until fragrant, a minute or two. Don't stick your face directly over the pan to smell if it's fragrant, you will get peppers in your nose. Add the meat and onions and season lightly with salt and sauté until the onions are translucent, about 5 minutes. Add the remaining vegetables and sauté until bright. Add the coconut milk and kaffir lime leaves (or zest) and let it simmer for a few minutes, until the vegetables are al dente. Add the fish sauce if using, a little more salt if not. If the coconut milk reduces too much before the veggies are finished, add up to 1/2 cup of water. Throw in the cooked rice and chopped egg and mix everything together, stir frying for another couple of minutes. finish by adding the jalapeno and basil leaves and cook for another minute tossing everything around in the pan until the basil is wilted. Garnish with a wedge of lime, sprig of basil, and/or cucumber slices. Non-game substitution: Any sliced meats make a good substitution. Chicken also goes especially well with this dish. Vegetarian substitution: Omit the meat and add some extra firm tofu and bada-bing! Vegetarian fried rice.